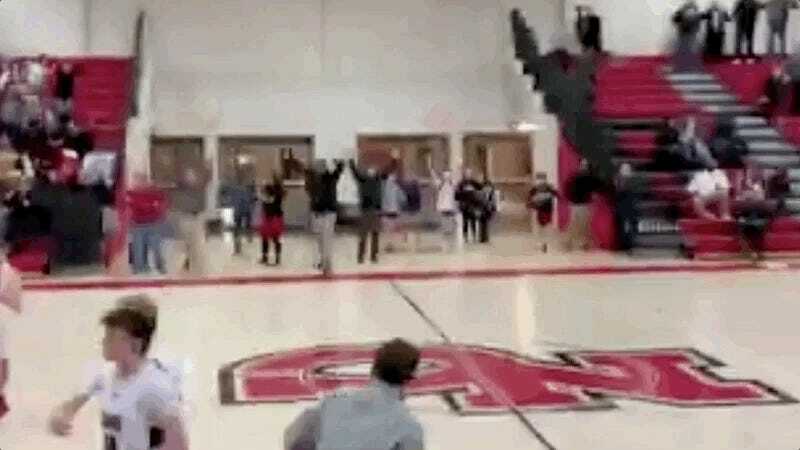 You will have to forgive this high school buzzer-beater for having taken place in the least dramatic setting, a dreary, overlit, too-large gym with clusters of fans spread over mostly empty bleachers. The play itself is very, very cool. Aaron Fishman of the New Canaan Rams sank three free throws with less than a second left to pull his team into a tie at 49 apiece with the visiting Stamford Black Knights. That left Stamford to inbound the ball from their own baseline with 0.9 on the clock. Surely this game was headed for either a long-shot Stamford win or overtime. Until! Congratulations to young Ryan for getting the peak moment of his athletic career out of the way before he is old enough to shave.